One of our families favorite “haute” resort destinations is located in the mountains of West Virginia. This National Historic Landmark has been welcoming guests from around the world since 1778. The Greenbrier Resort in located in White Sulphur Springs, WV. The Greenbrier Resort is rich in history and first drew guests over 235 years ago to its natural springs, and today it is an 11,000 acre luxury retreat. Guests to this magnificent resort include 26 of our country’s 44 Presidents. 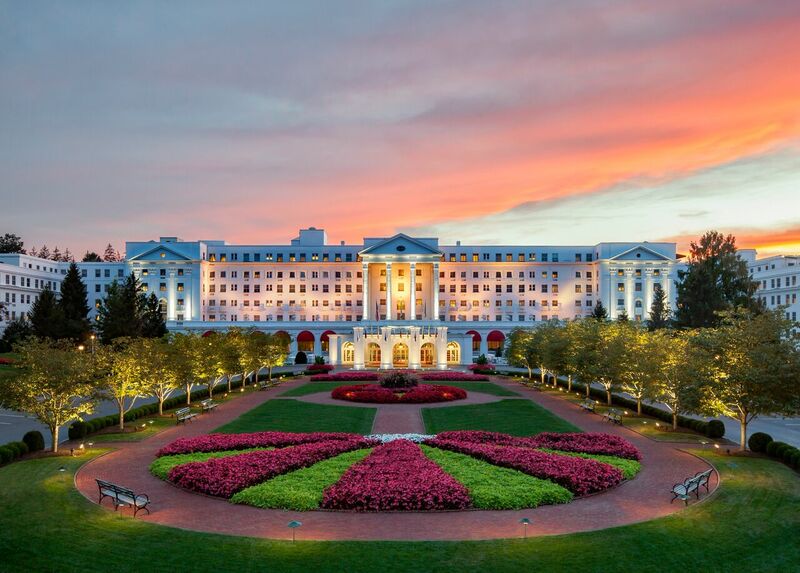 Let’s take a tour of America’s Resort, “The Greenbrier”. Nighttime view of this beautiful resort. The front entrance of the Resort has hundreds of tulips and is meticulously landscaped. Two lions greet visitors entering through the grand doors. The hallways to the guest rooms are adorned with color and oversized patterns on the rugs and wallpaper. The guest rooms are decorated in true Dorothy Draper Style. Dorothy Draper was a pioneer in interior design, dominating the field from 1925 to 1960 when she was named the most influential tastemaker in America. The high-society interior designer was hired to renovate the resort after it was used as a hospital during World War II. She left the hotel with a bold new personality that reflected the luxury of space, elegance and sense of history in every detail. As you walk through the hallways of the resort, comfortable seating areas are a plenty. One of the many rooms to enjoy for reading, cocktails or afternoon tea. More grand rooms with fresh flowers on every table. Let’s take a look at some of the art and paintings in the many rooms at the resort. This mural is painted on the wall. One of the many ballrooms in the resort. Let’s take a look at some of the resort chandeliers, most with crystal. One of my favorite rooms in the resort pays homage to Princess Grace. This is my favorite painting of all time, of the lovely Princess Grace of Monaco. It is stunning up close. Let’s head down to one of the shopping areas and take a peek inside the stores. Lets head to the Casino. Each night at 10pm, complimentary champagne toast is served to the guests as they enjoy entertainment from the Greenbrier dancers in the casino. The casino is over 100,000 square feet and features restaurants and a dance floor, a favorite of ours for nightly entertainment. Pictures inside of the casino are not allowed, but I was able to snap this picture of the Greenbrier dancers. The indoor swimming pool is enormous and a favorite with our kids. Let’s take a tour of the beautiful outdoor grounds. The tennis courts were being repaired during our visit. The outdoor pool is amazing and features an infiniti pool with mountain views. The resort at night is an incredible sight to behold. There is so much to enjoy at the Greenbrier including miles of hiking trails and a full service SPA. Have I enticed you to visit? I hope you enjoyed this edition of Happy Haute Home’s Resort Tour. Make sure to check back for a private tour of the “Sporting Club” for members only. This place looks like a royal palace from a European monarch! LOL! The Greenbrier is definitely a place like no other. If you’re ever in the area, you should check it out! I will, we are in DC early December, who knows, we might visit the place if time allows! Fantastic! There is so much to see and do here, you will love it!